I'm a fan of Fujifilm's "Most advanced" S100FS, even though its 11MP rating is less than the F series point and shoot they just released. Why? Because screw MP ratings! By dropping the MP count even further to 6, it can hit a light sensitivity of ISO 6400; drop it to 3MP and you've got an astounding 10,000 ISO. That's a better use of spare sensor space than goosing up to a MP rating good for poster sized prints. Although it borrows heavily from Fuji's S5 Pro camera in the feature department, this camera has no direct predecessor. The FS in the S100FS's model name stands for Film Substitute. The camera has a 14.3x lens, adjustable manually, with a 35mm focal length equivalent of 28-400mm. It's paired with a 2.5 tiltable LCD and both optical and digital image stabilization. The camera can also handle a new wide dynamic range of 100-400% for accurate capture of high contrast scenes. There are also simulation modes that replicate after the colorful characteristics of Fuji's film. The camera has face recognition, and although Fuji pioneered the tech, I'm not sure they've kept up with the times; this system does red eye and can detect 10 faces in a scene, but Sony's system can detect smiles and manually focus on children or adult faces. Valhalla, NY, January 24, 2008 - FUJIFILM U.S.A., Inc. today unveiled the FinePix S100FS (Film Simulation) digital camera, its most advanced SLR-styled camera to date. The FinePix S100FS provides an all-in-one solution for photo enthusiasts and advanced amateur photographers seeking the manual controls and functionality of a Digital-SLR, without the hassle and expense of additional lenses and other accessories. The FinePix S100FS is equipped with a 14.3x Fujinon manual zoom lens, Fujifilm's 8th generation Super CCD sensor with 11 MegaPixels, RP III processor, 2.5" tiltable LCD and ISO capabilities of up to ISO 6400 at 6MegaPixel and an incredible ISO 10,000 at 3 MegaPixels. Photographers will appreciate the ease of use afforded by Dual Image Stabilization which combines optical image and picture stabilization, and Fujifilm's acclaimed Face Detection 2.0 Technology with Automatic Red Eye Removal, while enjoying a wide dynamic range of 100-400% typically exclusive to the highest-end D-SLR cameras, and film simulation modes that only Fujifilm can provide. "This camera benefits from the culmination of Fujifilm's 8th generation Super CCD and 3rd generation RP (Real Photo) Processor technology development," said David Troy, senior product manager, Consumer Digital Cameras, Electronic Imaging Division, FUJIFILM U.S.A., Inc. "This powerful combination allows the S100FS, with its wide dynamic range, to capture the subtleties in color, tone and detail to deliver perfect shot conditions every time." Through a unique collaboration among Fujifilm and Fujinon R&D engineers, the development team approached the design effort as a single project, creating the lens and CCD for express function as a single unit. This design allows the ultra-high precision Fujinon lens to achieve maximum resolution at all focal lengths of 28mm-400mm equivalent and aperture stop settings. Because of the composite body and lens structure, there is no penetration of dirt and dust onto the CCD of a bright F 2.8 (wide angle) or F5.3 (telephoto). Fujifilm's engineers have incorporated some of the FinePix S5 Pro's features that have been most appreciated by professional photographers, including film simulation modes and settings that expand the camera's dynamic range. The FinePix S100FS has an extended dynamic range (100% , 200% , 400% ) that is similar to that of negative film, thanks to the newly developed 2/3" 11.1 megapixel SuperCCD VIII "HR" and the new RP Processor III. This camera prevents overexposure and underexposure, regardless of whether the subject is a landscape or a portrait, and Fujifilm's unique Film Simulation modes (FS) allow photographers to select the ideal "film" mode for the scene with a choice of four modes that optimize for portraiture, low-contrast (soft), vibrant colors (Velvia), or general use (Provia). Only Fujifilm has developed its camera technology from its photographic heritage in film which uniquely gives subtle changes in tone and color reproduction to provide the photographer the widest technical range for the best creative expression possible. Fujifilm's proprietary Face Detection 2.0, featuring Automatic Red Eye Removal, debuted on the award-winning FinePix F50fd. This one-touch selectable mode enables cameras such as the FinePix S100FS to detect up to 10 human faces in a scene, correcting focus, exposure and white balance automatically as fast as 0.05 seconds to ensure that photos of human faces are clear and properly exposed, no matter where subjects are located within the frame. Fujifilm's Face Detection 2.0 has an advantage over the other face detection systems currently on the market because it can identify faces at extreme angles - even in full profile. The system allows for up to a 90 O movement in either direction for profiles and up to 135 O for leaning or lying down in either direction, for a total range of 270 O. The Automatic Red-Eye Removal feature works in conjunction with Fujifilm's Face Detection 2.0, automatically correcting red-eye directly after the shot is taken and then saving both the original image and the corrected file. The user can then perform a side-by-side picture comparison in playback mode and select the most pleasing image. 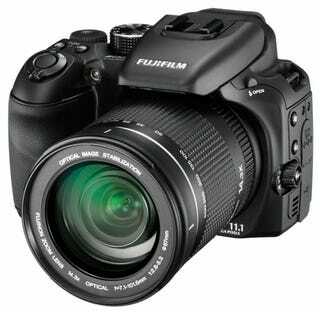 Dual Image Stabilization: The FinePix S100FS features Fujifilm's Dual Image Stabilization technology to ensure clean, sharp and blur-free images, even in low-light conditions. This combines image stabilization through a mechanically stabilized "floating" lens element to reduce blur from the photographer's hand-shake, with Fujifilm's Picture Stabilization Technology, to reduce blur caused by subject movement, for the ultimate in stabilization technology. Multi-Bracketing Function: The S100FS has three bracketing functions useful for high level photography: Film Simulation Bracketing, Dynamic Range Bracketing and AE Bracketing. High-Speed Shooting: Reliable high-speed performance is possible through Fujifilm's newly developed Super CCD VIII "HR" and the new image processor RP (Real Photo) III Processor. At 3-MegaPixels, a maximum of 50 continuous shots at 7 frames/second is possible. In addition, 14 scene settings and customer settings can be selected, as can four auto-focus modes offer convenient high-speed, high-precision shooting and focusing for a diverse range of conditions. Image Formats: Capture images in both JPEG and RAW format. Movie Mode: Movie mode with sound at 30 frames per second in VGA quality, and zoom capable with manual zoom ring while in movie mode. xD/SD/SD-HC Compatible Slot: The FinePix S100FS features an "xD/SD Compatible Slot" which accepts not only Fujifilm's traditional xD-Picture Cards but also Secure Digital (SD) and SD-High Capacity/SD-HC cards too. 2.5: Tiltable LCD: The FinePix s100FS features a tilting 2.5" LCD that makes it easy to frame shots from a variety of shooting positions. The FinePix S100FS will debut in February 2008 at a retail price of $799.95.